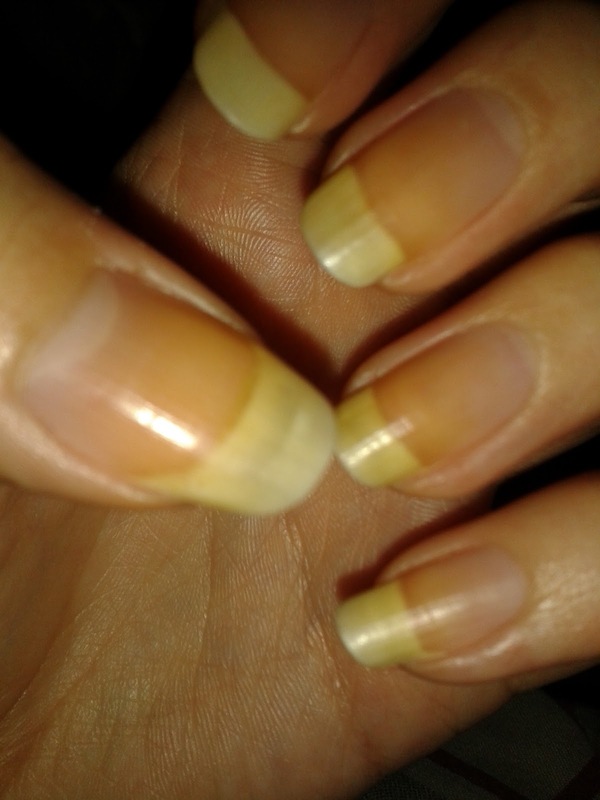 First of all, here is a photo of my uncovered nails. Sorry to scare you all with their nasty bareness but this is probably the longest my nails have ever been - thanks to Nail Envy - and I'm away to nubbin them before my big trip away. So goodbye long yellow nails, and hopefully they will grow back minus the staining. 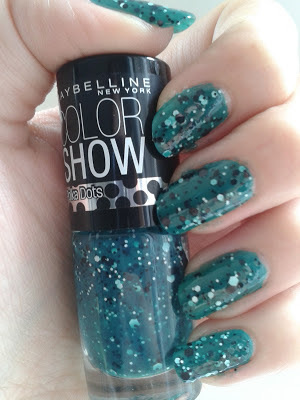 Now here's a polish I never expected to like - Maybelline's new Colour Show Polka Dot collection, which is a collection of four colours (green, blue, pink and black) full of spotty sequins to create that perfect speckled egg look that is so bizarrely appealing nowadays. I shrank away from these at first but couldn't resist trying them - and I was pleasantly surprised! 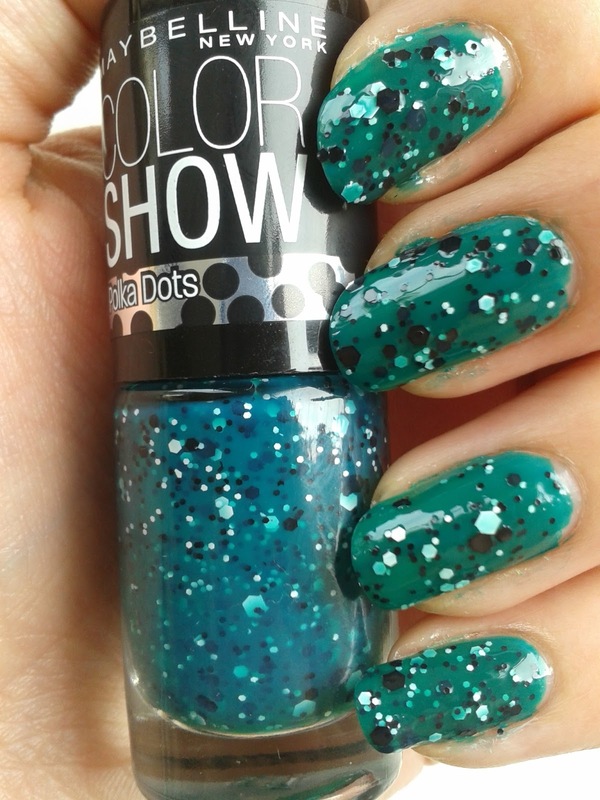 I bought the green one and wore it over one coat of a Rimmel green I've had for a while and it was so simple but yet so effective. The dots spread themselves out evenly, there was not much need for me to place them to cover up bare patches, so application was a dream. Removal was a different story, removing like your usual troublesome glitter, despite me using piCture pOlish's new glitter base which is meant to ease removal (bit disappointed - hoped that would be more effective!) 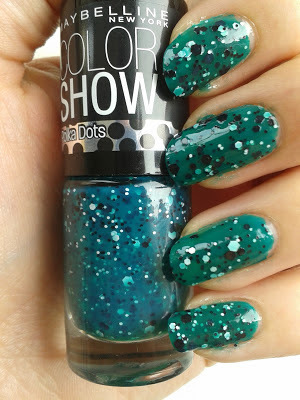 took me about half an hour to remove and I still have to scrape some dots off with the tips of my nails, so not great. One downside to this is probably the same downside most polishes like this have, and that is that any dots near the tips can begin to peel away leading to bit sticking out and catching in your clothes, which I wasn't a fan of and which led to early chipping. Shame. And now , a goodbye. As of this weekend I will be taking off on my trip to Africa to climb Mount Kilimanjaro for charity (my sponsorship link can be found HERE) so I won't be posting for a while - so I will apologise now for the abandoning of my blog. Wish me luck and love to you all - I'll be back before you know it, and with a better tan for my troubles! Glossybox June 2013 - Summer is here! British Nail Bloggers host a SUPER GIVEAWAY!